Former Pompey chairman Milan Mandaric, right, and ex-boss Alain Perrin. On this day in 2005, Alain Perrin was spared the axe – after a vote of confidence by his players. Milan Mandaric met five of Pompey’s team to find if Perrin had lost the dressing room. But the players backed their manager – buying the Frenchman at least one more game against Chelsea four days later. Neil Warnock remained Pompey’s first choice to take over if things didn’t improve. Fearing for his job, Perrin suggested the meeting to Mandaric to prove the players were still behind him. He asked five of the side who played in the 3-0 defeat at Liverpool to give their opinions. The quintet, who comprised senior players but didn’t include skipper Dejan Stefanovic, met Mandaric in the Fratton boardroom after training. 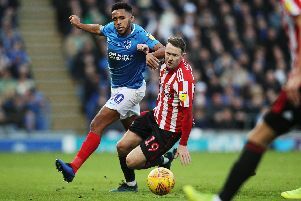 Pompey’s chairman was impressed with what the players had to say, but also with what he saw as Perrin’s courage in effectively putting his job on the line by arranging the meeting. Mandaric said: ‘ I don’t want to comment on the content of the meeting. That stays within the room. ‘But generally it was a very constructive and productive meeting. They are a good bunch of guys who care for Portsmouth and want to win. ‘I believe we have enough quality to keep us in the Premiership. ‘We’ve got to have faith in Alain Perrin. We’ve got to find a way to get us out of this hole. ‘As far as changes go, there will not be any changes for the foreseeable future.